This exterior door is made from gray, hammered metal that has been stamped for a quilted finish. 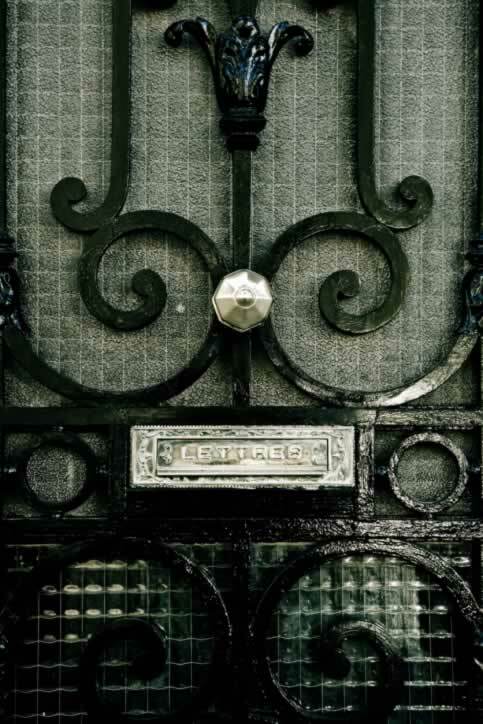 A wrought iron grille with scroll work in a black lacquer finish has been added to the face of the door. The grille's scroll work divides the door, similar to panels, with parallel bars along the door's lock rail. In the center of those bars is a mail slot with a stainless mail flap that is stamped, "Lettres." Along the muntin on the top half of the door, a single bar serves as the stem of a lily, out of which more scroll work blooms. Near the base of the fleur de lis, two scrolls form leaves, at the center of which is a stainless steel rosette. On the lower half of the door, a wire grid is placed between the hammered metal finish of the door and the scroll work and adds additional texture to the finished product.